I have had a hectic week, but as I am a member of get messy habit (dedicated to creating at least one page a week) I really wanted to, and managed to, squeeze in some art journaling time! I tackled one prompt; create your own palette complete with names. 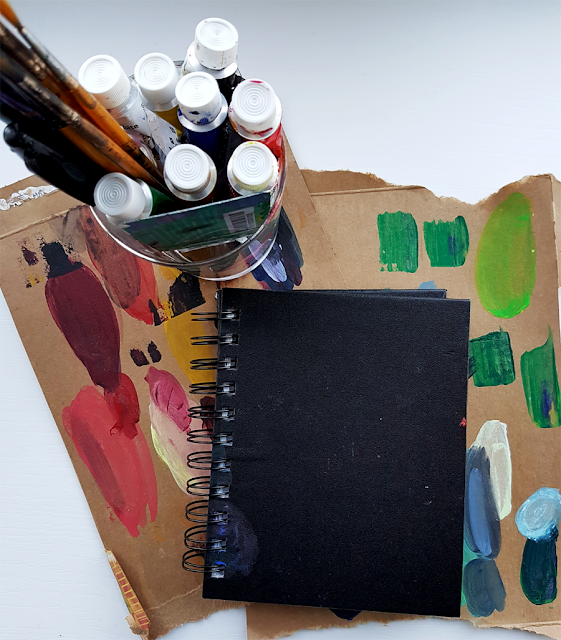 I used acrylic paint and had a great time creating my own blends. Naming colours is something I get to do at work so I was looking forward to being a bit more wild with this part! In the end though, I got a bit of writers block and went with more traditional names. Creating my own blends was something I wouldn't normally do, I am more used to just using the colour as it comes from the tube, or making quite basic mixes. I enjoyed this process so much though, I think it is something I will return to and I feel as if I have opened up a little part of my brain. 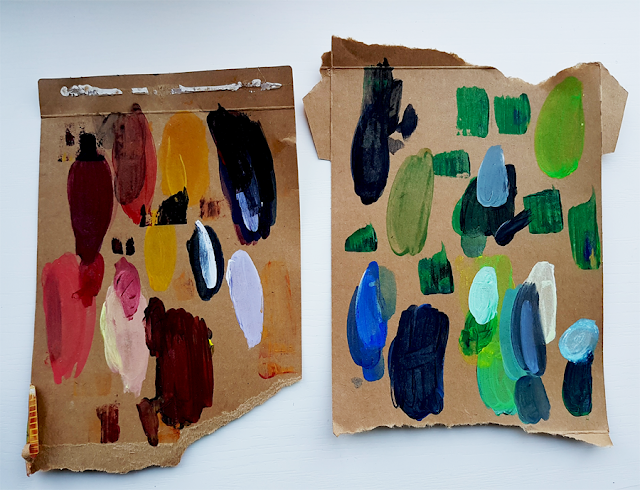 Supplies used - I don't have a palette to mix on so I used some old cardboard. I love the patterns my mixing made so will definitely be using this as collage fodder! Personal favorites being lemon frosting, parma violet (named by my husband) and mint choc. I also threw in a few personal names; lobster tail, Beatrice (the name and colour of my first car) and sunflower. A few of the blues I left un-named as I couldn't think of anything! I am hoping to get a bit more time next week to create more pages and actually practice the tutorials shared this week! I am with you on mostly using paints as they come from the tubes. But I watched August Wren class on gouache on Creativebug. And she was mixing ALL sorts of colours using just a basic set of paint. That's so mesmerizing. Really made me want to try and do that more. 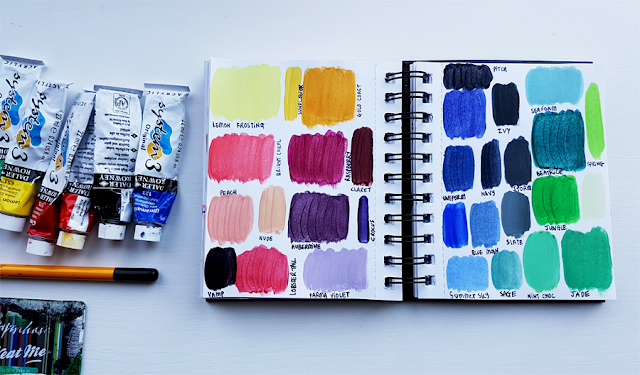 Mixing colors was my favorite exercise from Oh My Gouache. You know that red and blue make purple, but when you create that lovely eggplant color you feel so proud!